HOUSTON, Texas -- George H.W. Bush, who shaped history as America's 41st president and patriarch of a family that occupied the White House for a dozen years, is going to his final rest Thursday in Houston. More than 11,000 people paid their respects to Bush as his casket lay in repose all night at a Houston church where his family worshipped. Some visitors waited for hours to pay tribute to Bush, who will be buried following a funeral at St. Martin's Episcopal Church. As thousands streamed through the long line at Second Baptist Church, many shared stories of Houston's most famous neighbor. The only member of the Bush dynasty still in public, George P. Bush, says he and former President George H.W. Bush's 16 other grandchildren grew up in awe of the man they knew as "Gampy." George P Bush talks about the letters his grandfather would send and one of the foods he had to have: Blue Bell ice cream. Grandchildren of former President George H.W. Bush gave readings from the Bible at his funeral in Houston. Those reading passages at St. Martin's Episcopal Church included Barbara Pierce Bush, a daughter of George W. Bush, and Noelle Lucila Bush, daughter of Jeb Bush. Pres. Bush's granddaughters paid tribute to him by reading select Bible verses at his funeral. The Rev. Russell Levenson, Jr. told mourners Thursday that Bush had a "resolute faith" and once asked what heaven would be like. He told those gathered at St. Martin's Episcopal Church that he imagined Bush was greeted in heaven by his wife, Barbara Bush, "with her hands on her hips, saying 'What took you so long?'" Rev. Dr. Russell J. Levenson Jr. talks about praying for Barbara Bush before she died. Performing were some of Bush's favorite country music stars, including the Oak Ridge Boys doing "Amazing Grace." The Oak Ridge Boys perform Amazing Grace. Reba McEntire sang "The Lord's Prayer" as three days of official ceremonies in Washington gave way to more personal touches for the former president in Texas. Reba McEntire performs at President George H.W. Bush's funeral. The grandsons of former President George H.W. 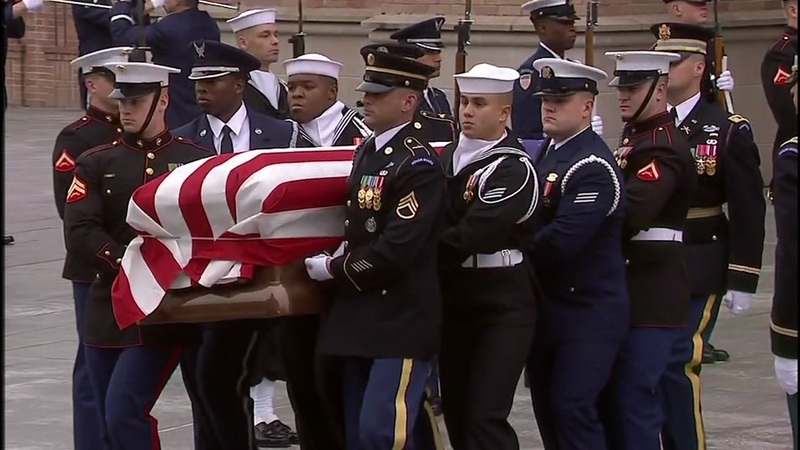 Bush served as honorary pallbearers at his flag-draped casket was carried out of a Houston church following the last public remembrance for the 41st president. Among the grandsons who served as honorary pallbearers at Thursday's funeral service were George P. Bush, Samuel Bush LeBlond and Pierce Mallon Bush. President Bush's casket leaves St. Martin's Episcopal Church. Thursday's service also attracted local sports stars.